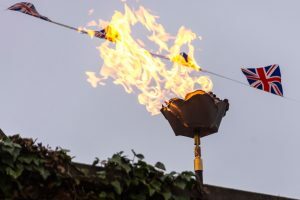 IT WAS a birthday to rule them all last Thursday as the people of Woking joined fellow communities across the country – and overseas – to mark the 90th birthday of Her Majesty The Queen. And nowhere was the party atmosphere more electric than in Pirbright where dozens poured into the village hall to rejoice as HRH blew out the candles on her landmark cake. Of course, once the smoke had dissipated, attention turned to lighting up another all the more regal flame, which burned simultaneously with more tha n 1,000 other beacons across the nation in honour of the Monarch. The red, white and blue of the Union Jack could be seen draped from every table, chair and ceiling, with the festivities capturing the heart of the nation just as the Diamond Jubilee celebrations had done in 2012. There could be no denying that this will go down as The Queen’s most memorable birthday. Let’s hope she has time to open all her presents and cards before her 91st rolls around. The Queen’s birthday in Woking Picture Special in this week’s News & Mail.